▷ Paragliding in Tenerife (Spain) - Come Fly with Us! The Sky’s the limit, freedom is yours. Whoever you are, wherever you come from, if you love nature, if you love adventure, if you love life… you are welcome to the best paragliding experience of the whole Tenerife! Let us accompany you through the infinite sky of Tenerife. Feel free to take off! Feel yourself floating! Feel fulfilled, free and intensely alive. Have you ever dreamed of flying? Tandem paragliding in Tenerife gives you the chance to experiment the feeling of flying like a bird. Our professional team will guide you through the most beautiful skies of Tenerife, while you just enjoy this adventure with us. If you choose to live the experience of paragliding in Tenerife, you will enjoy some of the most astonishing views that you have probably seen in your whole life. Those landscapes full of light and vibrant colours… we know that you want to try it! Because you need to live the experience to fully understand it. 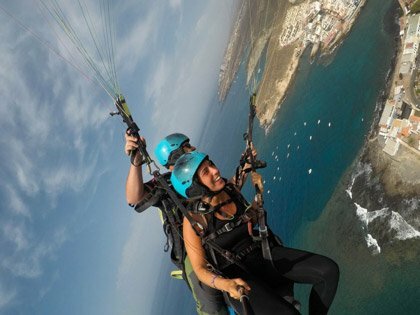 Get started with our most popular paragliding experience, a tandem flight over Costa Adeje, in Tenerife South. As we have told you before, our paragliding heaven is located in the paradisiacal south of Tenerife, concretely in our beloved Costa Adeje. We are inviting you to navigate through our webpage and discover all the chances to practice paragliding with us in Tenerife. Click on our webpage and discover all the dates available, our schedules, the meeting point, the duration, the altitude and the difficulty of each flight. Whatever you want, we will give you all the information needed to fulfill your desire. We accompany you and advise you at all times. We pick you up at your hotel, or at the meeting point, and drive to the flying area. Before starting the flight we give you a brief flight training so you are informed and know how to act. Relax and enjoy your flight, the views and a unique and unforgettable experience. Once landed you can ask for the photos and videos of your flight and keep the memory forever. Is paragliding the same as parasailing or parachuting (skydiving)? Paragliding in Tenerife is totally different from parasailing or Skydiving. You will take off from the mountain running a few meters and gently rise in the air. There is no feeling of free fall, we always say that the paragliding tandem flight in Tenerife is as close to flying as the birds. Everyone can fly in paragliding, from 6 year olds to seniors. As long as they are able to walk and run a few meters to take off and land. You don’t need any license or previous experience to fly. All flights are suitable for beginners. You will be flying with an experienced instructor who will accompany you in this experience. Your paragliding instructor will take the controls and guide you to the best places with the most spectacular views of Tenerife south. For the takeoff our instructors will equip you with the harness and helmet and explain what the takeoff consists of. All you need to do is walk a little and then run a few meters. You will be informed at all times so that you have a wonderful experience. Landing is very easy, the paraglider will approaches fast but slows down for a very soft landing. All you will have to do is walk a little. During the flight you’re covered by the tandem pilots insurance. Is there any possibility to leave personal things somewhere? You can leave your personal belongings, such as a backpack or purse, with our driver in the van. 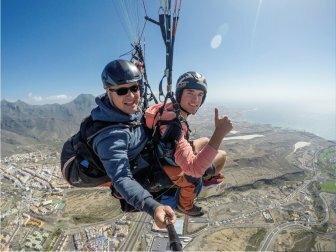 We advise you to carry small items such as a wallet, mobile phone or identity document in the passenger harness that you will use during the paragliding tandem flight. How can I get photos and videos from my flight? The pilots will fly with gopro cameras with a slefie stick that will be correctly secured to the equipment. With more than 26 years of experience doing paragliding in Tenerife, they will do a very professional job taking photos in the best times of the tandem flight and making video at all times. Once landed, you will have several options to buy them. How do we get to the launch area? 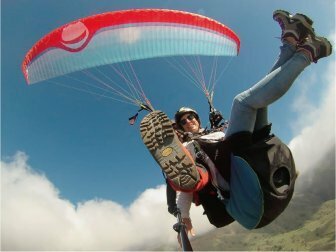 Once we pick you up at the agreed meeting point, the paragliding company places a vehicle at the disposal of the clients which will take you to the different paragliding take-off areas in Tenerife South. What should I wear or bring for paragliding? On Tenerife paragliding flights, the mountain temperature prevails, so dress in comfortable clothes and bring a sweater or jacket in case it is cool. It is essential to come with sports shoes.